Hortus Camdenensis | Achimenes patens Benth. In growth habit similar to Achimenes longiflora DC. which see. The solitary flowers are red-violet, flushed with yellow and dotted with violet on the white throat. To 30cm. It will flower for many months of the year. [Moore, Hortus, GRA p.32]. 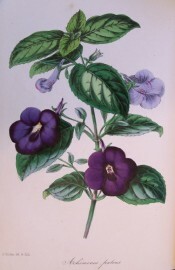 The London Horticultural Society, quoted in The Gardeners' Chronicle, described it as having ‘the habit and foliage of A. longiflora it bears flowers of so intense a violet that no artificial colours can imitate it.’ It was introduced to the gardens of the Horticultural Society in 1845 by Hartweg. [Gard. Chron. 1846]. 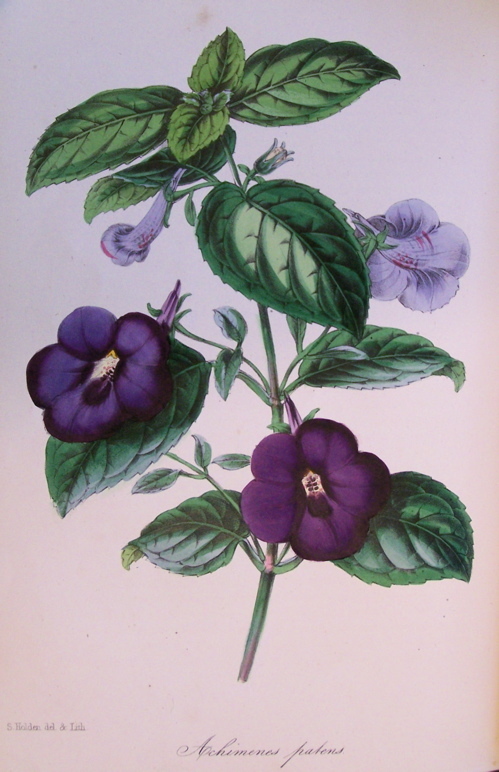 E. G. Henderson offered for sale in The Gardeners' Chronicle of 1849 Achimenes patens major, ‘a variety worthy of a place in every collection; the habit of the plant is good, and the flowers a rich dark plum colour.’ MB p.197/1846. FS pl.III 7e Liv./1847. Listed in the 1850 and 1857 catalogues [B.12/1850]. Obtained from Kew Gardens, brought out from England by Captain P. P. King in 1849. In the confirmatory list sent by Macarthur to King it is marked with a ‘o’, meaning new to the colony. [ML A1980-3]. It was also requested of James Backhouse on 1st February, 1849 but not recorded as received. [MP A2933 p.183].